ALBANY, NY (WSKG) – For the second day in a row, Gov. Andrew Cuomo held rallies criticizing President Donald Trump’s choice for the U.S. Supreme Court and urging action on a measure that would protect the right to choose abortion in New York. The governor is among many Democrats who believe that Trump’s choice of Brett Kavanaugh for the Supreme Court could lead to a repeal of the landmark decision. Cuomo’s official events as governor are converging with his re-election campaign efforts. The rallies were staged in key swing voter districts in the New York City suburbs, and he has released a digital campaign ad. “We know what Trump’s Supreme Court wants to do; we must fight back,” Cuomo says in the ad. The governor’s critics, which include his Democratic primary challenger Cynthia Nixon, said he has not done enough during his two terms in office to get the Reproductive Health Act passed. Nixon said Cuomo tacitly supported a group of breakaway Democrats, known as the Independent Democrat Conference, or IDC. She said the breakaway Democrats helped Republicans remain in control of the Senate for the past eight legislative sessions. If not for that alliance, Nixon said, Democrats could have been in power and the measure already would have become law. Nixon spoke at a news conference where she endorsed a challenger to one of the Independent Democratic Conference members. The IDC dissolved shortly after the state budget was passed, and reunited with the rest of the Senate Democrats, but the Democratic conference still lacks one Senate seat needed to hold the majority. Nixon has released her own video ad, which accuses Cuomo of being disingenuous on the issue. “It is time for Governor Cuomo to stop gaslighting New York’s women,” Nixon says in the video. 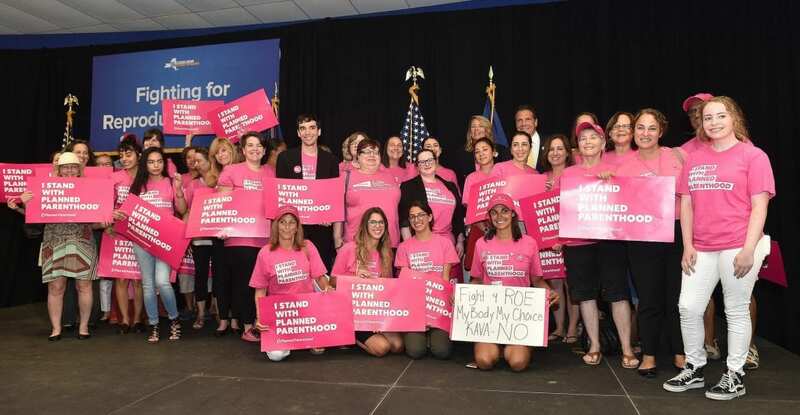 Robin Chappelle Golston, the head of Planned Parenthood Empire State Acts — the lobbying arm of Planned Parenthood in New York state — said her group is grateful for Cuomo’s efforts, and she puts the blame back on the Republicans. Golston’s group is nonpartisan, and she said they would back Republicans for election to the Senate if they supported the Reproductive Health Act, but so far, no GOP candidate has done so. A spokeswoman for the Senate Republicans, Candice Giove, said the bill would allow nondoctors to perform abortions and might lessen rights of pregnant women who suffer physical abuse. Though Cuomo is urging the GOP senators to return and vote on the measure, he’s stopping short of forcing them to come back by calling a special session of the Legislature. He said he can require them to return, but he can’t require them to take a vote.